I took my daughter and her nanny to the Thu Le Zoo in Hanoi yesterday. 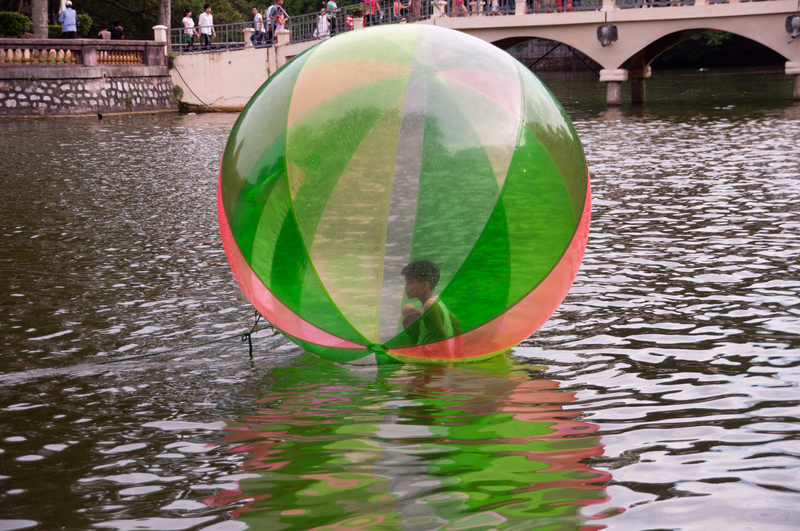 They have this activity set up on the lake where people (mostly kids) climb inside an over-sized beach ball which is then filled up with air, sealed, and rolled out onto the water. The kids then enjoy bouncing around – but mostly falling down – on the water for about 15 minutes before young men working lakeside pull them back in using a tether. It all seems like harmless fun, but I would never dream of taking my daughter in one of these. As long as it’s fully inflated, the beach ball is easy for the men to pull back to the edge of the water. But if, god forbid, it started leaking air and/or water started seeping inside, the person would start to sink and would provide considerable drag, making it difficult to pull them back. Not to mention the fact that they’d be sinking in water while fully-wrapped in plastic.